Have you noticed that every document you create in Illustrator contains a bunch of default swatches, graphic styles, brushes and symbols? These can make it difficult to locate and use the specific swatches, brushes etc. that you create for the project at hand. In addition, they make your AI and EPS files larger than they need to be. You can fix this. Here's how to do it in Illustrator CS3 and CS4. 1. Search your computer for a folder named New Document Profiles. The location of your folder may vary depending on your configuration. Make a note of the location where you found the folder. You will need this later. 2. Run Illustrator, and choose File > New. 3. 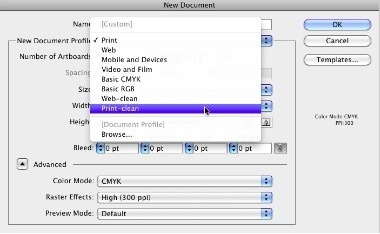 In the New Document dialog box, choose Print (or Web) for the New Document Profile, then click the OK button. 4. Choose Window > Actions to display the Actions panel, and play the Delete Unused Panel Items action. This will delete the extra swatches, brushes, graphic styles and symbols from the blank document you have open. 5. Examine the Swatches panel. You may see a few stray swatches or Color Groups still there. Delete any of these that you don't want. If you have certain colors that you DO always want to appear in your Swatches panel, add them now. 6. Choose File > Save, and name the file something like "Print-clean" (or "Web-clean" if you started with the Web profile in step 3). Save the file into the location you made note of in step 1. 7. Choose File > Close. That's it...you're finished! To start a new file with the "cleaned" settings, choose File > New, and choose Print-clean or Web-clean for the New Document Profile, and a new document with nice empty swatches, brushes, graphic styles and symbols panels will appear, ready for you to create your own swatches, brushes, etc. Very good list of steps! I am learning the nuances of illustrator.. ;) To create web icons, should we use CMYK or RGB color profile? @Santhosh: When creating artwork or icons for the Web, use RGB.